We fought this battle a while ago, my bad for taking so long to upload the pictures. Sorry I haven't bothered to annotate the photos and do a proper battle report but basically we only included warhounds, super heavy tanks and flyers in this Apocalypse battle. The opening turns saw both sides titans stalk forwards tentatively trying to gauge the right distances for their weapons. The board was long enough that even the turbo lasers were way out of range at the outset! The super heavy tanks were massively hampered by being so far out of range and rushed forwards to try and close the gap. However as soon as they got within range of the chaos titans' weapons they really started to get punished. Just not able to return the same kind of firepower. Any terrain that was in the line of sight of a shot that gave the target a cover save was removed to represent it being hit and destroyed in the process. As a result the no-man's land in between the two sides started to get leveled pretty quickly. Loyalist fighters targeted the chaos warhounds and scored first blood when one titan went critical and detonated spectacularly. Luckily the gods were watching and there wasn't much friendly armour nearby to get caught in the blast. Only the buildings were reduced to smouldering slag and the ground turned to glass. Soon after, the Emperor's forces suffered horrendously as one of their warhounds went critical. In this case however, the loyalist armour was quite bunched up and traffic jammed. As the titan exploded it took lots of armour with it. The blow would prove to be the critical turning point in the battle. Loyalist fighter bombers kept up the attacks on the chaos titans but were repeatedly shot down in the hurricane of bolts fired from the vulkan mega bolter of the rearmost warhound. Eventually the last loyal Titan charged forwards as his chaos counterpart did the same. 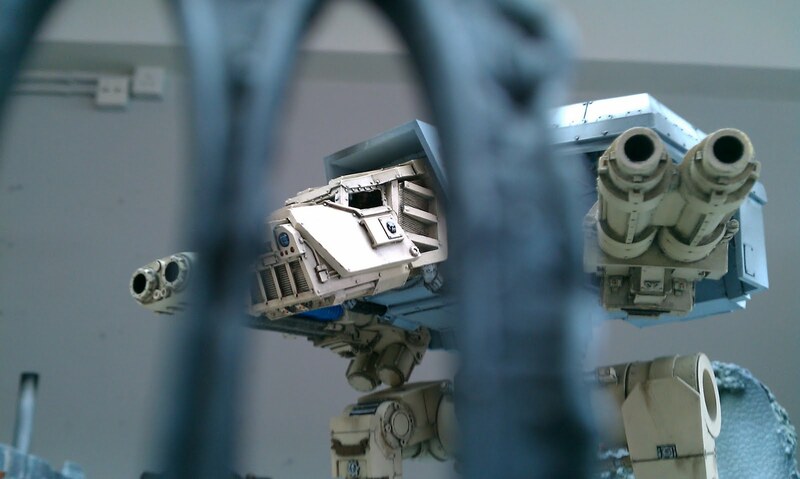 Both exchanged turbo laser fire and while the chaos shots were initially wide of the mark and seemingly allowing the Emperor's titan off the hook they reacquired and finished the job. Notes: While overall this battle was a shining success and great fun (the lack of pesky troops on the ground really made a difference and made for a whole different type of game) we will definitely make some changes the next time. Firstly, we will make the board more of an 'L' shape so that both sides have the same starting layout. The chaos forces really had an advantage in its deployment zone, whereas the loyalists had to deploy in a very narrow alleyway which hampered them considerably. As was felt when the titan went critical and took over half of the army with it. Secondly, because this is a titan only battle they really needed to be able to move more freely and still shoot. To represent the warhounds' ability to move rapidly. So next time we will allow for a larger movement distance as standard. What we found was once we were all in range we just stopped moving and traded fire. It would have been nice to have warhounds moving around trying to flank and using the terrain to hide behind. Thirdly and finally, we will probably try and balance the weapon loadouts more fairly and allow the super heavies to move further as well. They were at a massive disadvantage for too long and didn't really get going in the battle. But overall a great inaugural titan only battle! This was a great game - and thanks to Alex to posting this up. Went suprisingly quickly: we had decided that this battle would be titans and super heavies only. Allowing titans to blast intervening buildings apart also helped keep the game dynamic, as hiding titans could be smoked out into the open.